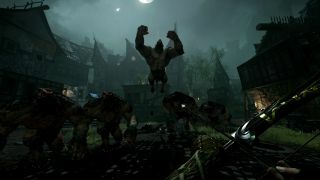 Warhammer: End Times—Vermintide was one of the happier surprises of 2015. It earned an Editor's Choice award in our review—which I most certainly did not see coming—and gamers clearly liked it, too, to the tune of more than 500,000 copies sold. Vermintide has so far had two free and one paid DLC release (most recently the sneezy-sounding Schluesselschloss) and the next one is expected to be ready by the beginning of May. Before that, however, the studio said it will push a new, free update that will address a very common complaint: That the game is just too easy. The new Death Wish difficulty doubles—no, triples!—everything. Skaven, Ratling Gunners, Rat Ogres, Gutter Runners—triple all around! And as you can see from the trailer, that's a whole lotta rats. Now, you might be thinking to yourself that this is just an April Fools prank, and you may well be right. But while it's obviously a lark, I'm not quite fully convinced that it's not real. It seems like it would be simple enough to do, after all, and based on the response in the Steam and YouTube comments, a lot of people actually want to try it. Update: Alas, Fatshark has confirmed that Death Wish mode is a April Fools gag and nothing more, at least for now. "However, if a lot of people genuinely want this difficulty added to the game, then who knows what future updates might bring," a rep told me. Pity.